A Lisburn man who was part of a three-strong gang that beat an autistic student in a disused warehouse and left him for dead has been handed a 10-year sentence. Judge Patrick Lynch QC told 20-year old Ryan Craig that while he will be released from custody after serving his sentence, his victim Scott Vineer “will never be released from the imprisonment you subjected him to”. Craig, from Ashmount Gardens in Lisburn, was initially charged with attempting to murder Scott Vineer in September 2012. He denied that charge, but earlier this year he admitted assaulting Mr Vineer causing him grievous bodily harm. He will serve half of the 10-year sentence in custody, with the remaining five years spent on supervised licence upon his release. Mr Vineer attended sentencing at Craigavon Crown Court on crutches, flanked by his mother Helen-Louise Doney and his stepfather. Mr Vineer revealed that he cannot remember anything about the brutal assault he was subjected to. Reacting to the sentence, he said he was “half way between annoyed and relieved”. He was a 17-year-old student at the time of the life-altering assault. 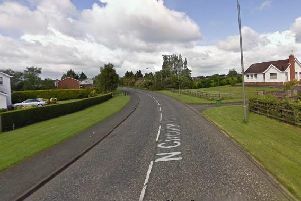 He was attacked as he made his way home from Lisburn Tech and was beaten so severely that he had to be identified from bracelets he was wearing. His failure to return home from college on September 6, 2012 sparked a manhunt which resulted in him being found with serious head and brain injuries in the grounds of the disused World of Furniture store on Laganbank Road. A previous hearing was told that Craig and two other males who were not before the court led Mr Vineer to the disused warehouse where they beat him. Once on the ground, the defenceless Mr Vineer sustained numerous kicks to the head. Craig, who at the time of the attack was a fellow student at Lisburn Tech, then proceeded to batter Mr Vineer as he lay on the ground with a plank of wood. As his victim lay unconscious, Craig then rifled through his pockets and threw away his mobile phone. This action, the prosecution said, “removed Scott Vineer’s chance of contact with the outside world”. During Wednesday’s sentencing, Judge Lynch spoke of the impact the attack has had on Mr Vineer, saying that three years after the incident he has “significant ongoing physical limitations”. The judge also spoke of the “profound effect” the attack has had on Mr Vineer’s family, particularly his mother who was initially told that her son may not survive. Regarding the attack itself, Judge Lynch said that while it had to be accepted that Craig did not inflict the “major injuries”, he was a “willing participant” in the assault on Mr Vineer, and that he “clearly and deliberately involved himself” in the attack. Craig’s barrister Gavan Duffy QC made the case that his young client was remorseful for what he had done. However, Judge Lynch greeted this with scepticism and said that his criminal behaviour since the attack – which has included a petrol bomb attack on police – would suggest otherwise. Mrs Doney revealed that the night her son was found, she was told by medics that they expected him to die. Despite being left in a coma due to the severity of his brain and head injuries, Mr Vineer defied the odds. However, the lasting impact the attack has had includes brain damage, tremors in his left arm, and issues with balance as well as short-term memory and speech problems. His mother said that while they as a family welcomed the fact that Craig was now serving a sentence, they were disappointed at the length. And she also urged the two other males involved in the attack on her son to “do the right thing” and tell the truth. Mrs Doney said: “When we came to court last week, we heard that Craig could have been given a 15-year sentence – so we’re a bit disappointed he didn’t get 15 years. “And as for Craig showing remorse, he had never once offered an apology either through the court or through his solicitor.